This is without doubt the most distinctive album Sweet ever produced. It is both very varied in itself and very different from almost anything that they had released before. In a lot of ways it was Sweet taking a risk. Not surprisingly, judging by my unscientific study of the Sweet message boards, there is a varied response from fans ranging from those who love it to those it just doesn’t appeal to (with every opinion in between). It shows many aspects of the band that are easily overlooked on previous albums and shows and otherwise unseen aspects for the first time.. After the disappointing reception of ‘Off the Record, the band clearly decided that they had to do something different. They could have called it a day, they could have tried again with another recognisable Sweet album. Most bands would at the most have settled at the most for a variation on the usual theme. In a change of direction every bit as dramatic as the break from Chinn and Chapman they went from heavy/hard rock to produce the softest of soft rock albums. LH is grown up music in a similar way that Fleetwood Mac is, not teenybop, but not rocking either. In between OTR and LH, Sweet had released one final single on the RCA label – ‘Stairway to the Stars’. That should never have been a Sweet single, being charitable I can only assume that their contract must have required a release. As a minor aside I was a member of a fan group called the ‘Sweet Appreciation Society’. I had corresponded for years with a girl from Yorkshire (about 200 miles away). When she bought ‘Stairway to the Stars’ she wrote saying she ‘wasn’t going to bother with Sweet any more’. I suppose for me this reinforced the fact that things were at a low ebb. Then out of the blue came a hit single ‘Love is like Oxygen’. It made the top 10 and oozes quality. Brian’s vocals are perfect and it is underpinned by a restrained but grinding guitar. Even better at least the music press was starting to give at least some grudging credit to the band. Perhaps they would finally get some credit for their talent? When the album arrived, I was intrigued. The first track is the ballad ‘Dream On’. A bad start from my point of view – I can’t stand it. The lead vocal is by Andy and that was a mistake. Andy was a key part of the band’s vocal harmonies, a or even the major creative influence and lead guitarist. His voice as a lead singer though is adequate at best. That doesn’t matter so much on a loud upbeat number, but comes out strongly on ballads. This is probably heresy on a Sweet Web Site, but I don’t care. He always sounds like he has a cold and there is a note in his voice with the same atmosphere of slight depression you get on a wet winter’s afternoon in Wales. The next tack is a long version of ‘Oxygen’. It remains an excellent song, but this version really only adds an instrumental interlude doesn’t work and the single version (which omits this) is far better. Also on side one is one of my favourites on the album ‘Silverbird’. It is one of the few tracks on LH where you can actually hear Andy’s guitar. If I was compiling my own Sweet greatest hits CD, it would be on it and as I hope you have gathered if you have read my other reviews on this web site, is quite a complement! ‘California Nights’ has Steve singing lead. and later became the second single from the album. Presumably this was chosen after Brian’s decision to leave. It is quite laid back, almost Eagles like in feel and I would be perfectly happy to listen to in on Route 1 (if I have remembered the number of the California coastal highway correctly). ”Strong Love’ has a funk rock feel. It is a song that I can never make my mind up about. I come down on the whole in favour of it not really being my thing, but on the other hand in the right kind of mood, I think its great. Really it is a good attempt a style that doesn’t usually appeal to me. It also illustrates one of the themes of the album, a huge input of ideas translating as probably Sweet’s most musically varied album. ‘Silverbird’ is a classic soft rock song and could even have been a single. It probably gets on my mythical Sweet CD along with Oxygen. Brian’s voice sounds great, it’s catchy and also shows a commercial, yet grown up side of the band. Fountain is the final track on side one and is an excellent song with lead vocal taken by Andy. Since this is also a favourite Sweet track of mine, how do I reconcile this with my comments about ‘Dream On’ above? “Double standards!” you might mutter to yourself. Well it’s simple really, with Andy on lead it’s a good song, with Brian it would have been a great one. (I feel the same way about ‘Lady starlight on ‘Desolation Boulevard). Side two begins with ‘Lady of the Lake’. This is the track that reminds you that a lot of LH was written in a castle where the band went presumably in search of some piece and quiet. I really like this one, it has a feel of King Arthur the round table and old fashioned musical instruments that I don’t mention by name only because I am not sure I can spell them! Recently I heard a recording of Brian’s from the late ’80s when his voice had gone. Feeling sad, turned to this track to hear him in all his glory. On the other hand, I could understand some people not appreciating it as it is definitely a like or loathe song! ‘Lettres D’Amour’ is another variation on the album’s theme of departure from the style of previous albums, for me it would be right up there with the tracks on this album that get an enthusiastic write up, except for one thing. You can call me pedantic if you like but there are 2 lines in the chorus that ruin the whole song for me. The first line is sung by a French woman ends with the word France being pronounced with an authentic French accent. The band than sings the second line which ends in the word romance – in an equally authentic English accent. The lines don’t don’t scan but they are obviously meant to. Whenever I hear this it grates on me like someone scraping their fingernails down a blackboard. Sorry, I can’t help it. Other less pedantic fans are of course free to enjoy the song, which is a good one really despite my cringing. ‘Anthem 2’ is an instrumental that I have never really seen the point of unless it is to fill the time until the final track starts – ‘Air on A tape loop’. AOATL is also an instrumental. Actually, to be accurate, it does have one line- ‘Alpha Beta Gamma Delta’. It is pleasant enough though maybe it does veer a little close to the background music boundary to be safe! Overall, my reaction to the album was positive. (Strange really, it competed for space with my new loves – like the Jam and the Clash). However, despite some reasonable reviews for a change, it disappeared without trace as far as the charts were concerned. There is an exuberance of ideas on the album that is refreshing. Not all of them work, but enough do to make it a good album. I felt that this might be the start of a new era when the band revitalised would explore musical areas, gain more respect and do justice to their talent. Sadly it was not to be. LH is also the last album by the classic Sweet line up. Brian was to leave during the recording of the next album and there was no single timed to follow up on the success of ‘Oxygen’. I will talk a little more about the break-up and my thoughts on it in my review of ‘Cut above the Rest’, for now just let’s say that LH was the end of an era. A while later (after Brian left I think) ‘California Nights’ was finally released as a single, but made no impact. A release soon after Oxygen would at least have had a good chance of airtime, but the momentum was lost. LH is an interesting album, I am aware that the term ‘interesting’ could sound like I am damming it with faint praise. I am not. What I mean is that for me it has the sound of almost youthful exuberance, the sound of a band who had decided to really, really experiment with a variety of different styles for the first time. This is also a good point to consider the classic Sweet line up as a whole. Well they are my favourite band and they could write, sing and play quality songs that still have an excitement and freshness over 20 years later. They are one of the most underrated bands since Elvis released his first song. Sweet was also long lived – a lot longer than most bands. Not everything they did was classic, there were failures too. They were human after all. But most of the time they consistently produced great music. There is another side though. and I don’t mean the tales of them being prickly and aggressive, badly behaved or the drug and drink problems. To be honest I don’t care and I am sure most fans don’t either whether these stories where true or not. What I mean is that Sweet never reached their full potential. They are my favourite band, but still I feel they could have done more. My theories are not based on any inside knowledge, I never met them or knew anyone who did. But I see a picture through the albums, interviews and events. The first thing I would say is that the band was a complex mix of contradictions, insecure in some ways, arrogant in others. I felt, much as I liked say Give Us a Wink that they were too anxious to please the rock establishment. GUAW sounds like a heavy album done by Sweet, but it doesn’t push boundaries. Most heavy bands don’t but that’s no reason Sweet couldn’t have done. I would have liked them to push forward with developing their own style more than they did. That’s one reason why I welcome LH. Experiments won’t always work, this one mainly does. 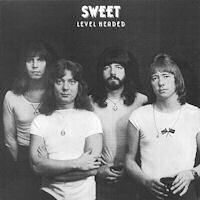 Respectable super group bands in the 70s paid little attention to singles, so Sweet did the same. There was no reason for this, few artists have measured the combination of immediacy and quality needed to be successful in the singles market. There is no rule that a single needs to be commercial pap to be a success.By the way I include the Chinnichap singles in saying Sweet mastered the art of producing classic singles better than almost any of their rivals. They could take a song and move it onto another level when they were in the mood, Singles success would have been the best way to come to the attention of new audiences. Number One’s weren’t necessary for this, but I think the odds were too stacked against Sweet as an album band. A ‘singles as advertising’ approach would have worked better. The failure of LH after ‘Oxygen’ might seem to disprove this, but remember singles success is cumulative. What would another hit 2-3 months after ‘Oxygen’ together with a tour done for LH? Having said above that in some ways the band was lacking in confidence, in other ways they could be maddeningly complacent! It must have been easy to buy your own publicity and feel that it wasn’t necessary to take quite as much trouble as before. This is seen in overlong delays between tours, a generally more casual attitude to singles after ‘Action’ and before ‘Oxygen’. They quite simply couldn’t afford to do this. I remember reading an interview with Phil Wainman where he made the point that Sweet on their own never as he put it ‘had a plan’. I think there is some truth in this. The band would always have rebelled against any manager, but they needed someone to keep them focused. Maybe even it’s the case that it was good for them to have someone to rebel against? I always have the impression that they tended to lurch around in direction slightly. Turing to my final point in the Sweet summary – charisma. The difference between good bands (of which there are many) and great ones is only partly down to music. A big part of it is the excitement a band can bring and the associated charisma. It’s a largely indefinable and a very subjective quality, but you know if it is there or not. Sweet had it. But this brings me onto an interesting point. Most of the band had it. Mention the band with the blonde singer to anyone around in the ’70s and they will know what you mean. Steve also had charisma. He became famous for his one liners on singles, but he had the quality anyway. Mick as well as being a great drummer also had an indefinable something. There was an English music show called Top of the Pops (it’s still running actually). Sweet were regulars on this. I remember Mick doing drum tricks, and Brian and Steve exuding a presence. Now for my point: there was also a guitarist with black hair. In other words Andy didn’t have the presence of the others. I only saw the three piece Sweet once, but felt the same. When they moved onto more serious music, he might have hoped this would change. After all this was the days of the guitar hero and he was lead guitarist, he was also a big part of the musical side of things. Look at any album and there is a mind boggling array of instruments he played, he was also a big creative influence. Now maybe my views are coloured by the fact that I have never really been impressed by guitar heroes, overlong solos and self indulgence have always bored me. But again judging by gig reports from overseas concerts and the occasional article about the Sweet, I still think some of that Andy being overshadowed tendency remained even after the Chinnichap days. Reading between the lines of interviews during the 70s I formed the impression that Andy wanted to be seen as the leader, or at least to be recognised as the driving force of the band. I wonder who much this contributed to the tensions that developed? Andy as part of Sweet, definitely. Without him something would be missing. But and this is a big but, Andy as the member who most caught the imagination, or as a lead vocalist – No. Not compared to Brian, Steve or even Mick (well maybe not Mick on lead vocal either actually). I don’t mean to make this to end up as an attack on Andy, but it is the way I see it. So where does that leave us? Sweet were a great band who tragically were never fully recognised. Even worse they could have been even more. Oh Well. LH would probably surprise anyone who has not heard it before, particularly anyone who has been exposed to Sweet’s other albums. It is an almost experimental album and has moments that work really well, and some that don’t. On balance though, it is a good and polished album.